FXTM is primarily a Forex trading service, but you can also trade in commodities and CFDs (which include shares in major international companies such as Amazon). They offer 8 different account types to suit your needs, capital and trading style, plus two trading platforms (MetaTrader 4 and 5) which work on PC, Mac and mobile devices. As with all online trading, you can lose money as well as make a profit, with significant risks on Forex and CFD trades. 8 different account types to suit your needs, capital and trading style. We were particularly interested in ForexTime.co.uk for their range of trading accounts and trading instruments. You can choose from a demo account (to practice your trades) or a live account (using real money). Within these, there are 8 account types to choose from: Standard, Cent, Shares, ECN, ECN Zero, FTTM ECN MT5, Strategy or FXTM Pro. Each account comes with different benefits and requirements. For example, the Cent account requires a minimum credit of just £5 and allows you to trade with fixed leverage with spreads from 1.5. 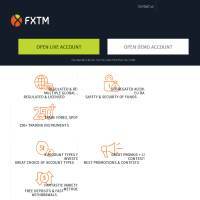 Meanwhile, the FXTM Pro account requires a minimum deposit of £25,000 but comes with a number of benefits which include an increased maximum volume for trades. A full list of the differences is provided on the website. Trades are executed quickly, meaning that your trading decisions can achieve their full potential. 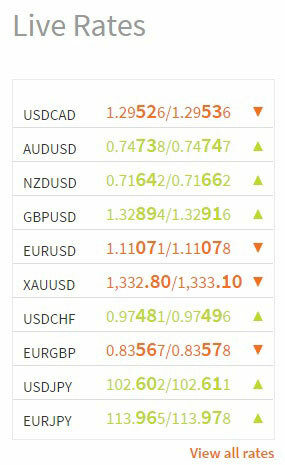 You can quickly and easily check live rates for Forex currency trades. Trades are executed quickly, meaning that your trading decisions can achieve their full potential, as you don’t need to wait around whilst prices change. These stats can be checked from a variety of devices, with the MT4 or MT5 platforms. Users can choose which platform they prefer, and the free demo is a great way to get to grips with the intricacies and differences of each. Instantly review current rates for quick sales and purchases. The Strategy and Copy services are particularly interesting. Using these account settings, you can adopt the strategies of trading specialists to make trades without needing to know a lot about each market. You can also view the risk level of such investments, the time remaining and its overall ranking. View risk ratings and other data on potential trades. Forex Time is primarily a Forex (or currency pair) trading service, but it does cover a couple of other important trades. So, let’s look at those in a little more detail. High-tech Forex trading tools have been developed to help you invest in currencies. These include tight spreads from 0 pips (though 0.1 to 0.9 seems to be more common). ForexTime take protection and security seriously in volatile markets such as Forex, so provide great security measures to protect your account, as well as super fast execution on trades so that your trades are as smooth, quick, and (hopefully) profitable as possible. There are also a wide range of articles and learning tools to help you better understand Forex markets and how to navigate your way through currency pair trades. Videos, seminars, webinars, glossaries and more help to develop your trading tactics on the Forex markets. A professional, quick response system for Forex trading. Trade precious metals (gold and silver) with buying power of 500 times investment. Tight spreads are competitive on commodities (starting at 0.5 with a standard account, but as low as 0.1 on ECN accounts). Variable lot sizes allow you to control your activity with micro, mini or standard lots. Invest in commodity futures (such as oil), indices and ETFs by paying the difference in value of each asset (from the price you buy at, to the price you sell at). You can take up long and short positions, with lower costs than trading the underlying stock (but with the same potential gains and losses). With sophisticated trading technology, super fast executions on trading decisions, and 8 different account to choose from, FXTM offers its users a professional, quick response system for Forex trading. Beyond Forex, its range is a little limited, but it’s certainly worth checking out the platforms to find out whether they suit your trading style. Quick response systems work well on volatile markets such as currency exchange, making FXTM a good contender in this market.